Mary Katherine “Katie” Beckett, an unwavering leader in the disability community, passed away on May 18, 2012 in Cedar Rapids, Iowa. She was 34-years-old. At just three years of age, Katie changed the disability world forever. Katie had spent nearly the first three years of her life in the hospital due to extensive medical needs when her doctors decided she could live at home with the proper supports. However, Medicaid would not cover the costs. 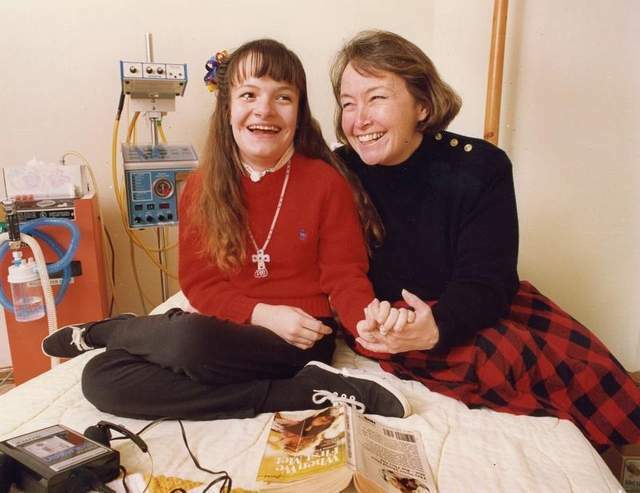 Katie’s mother, Julie, fought and advocated tirelessly for Katie to live at home, resulting in the creation of the “Katie Beckett Waiver,” a landmark Medicaid program that allows hundreds of thousands of children with disabilities and fragile medical conditions with the opportunity to live and be supported at home rather than in hospitals, nursing homes, or institutions. Click here to read the full statement from Secretary Sebelius and for links to other statements, national articles, and tributes to Katie. In lieu of flowers, a scholarship in Katie’s name will be established at Mount Mercy University for a student with a disability or special health care need. Dear Friends,I would like to take this opportunity to again thank you for your support and your continued membership in the Friends of NCBDDD. The Friends of NCBDDD has seen a tremendous growth in membership in the last year. Our membership now stands at 468 organizations/individuals which reflects a significant increase over the years. As NCBDDD has broadened their priorities and initiatives in the birth defects, disability, and blood disorders communities, the Center has become increasingly visible at the federal, state and community level. This continual positive exposure from the Center and its partners has had a direct impact on the membership growth of the Friends of NCBDDD. The Executive Committee is committed to growing our membership and dedicated to seeing partners work together and support each other and NCBDDD in our daily work. All of us share a common interest in promoting the health of babies, children, and adults, and enhancing the potential for full productive lives for the populations we serve. As fiscal resources remain tight, we all need to do a better job of looking at our natural partners and seeing where we can share resources and complement each other in order to be more effective and efficient in meeting our constituents’ needs. By joining the Friends of NCBDDD we have all taken the right step. We have all heard the cliché, “numbers represent power” and we can all make a difference in the lives of the people we represent if we 1) support and partner with each other, 2) grow the Friends of NCBDDD membership, and 3) educate our colleagues about the extraordinary work of NCBDDD and its partners over the last 10 years. In order to continue to see the Friends of NCBDDD membership grow and expand the visibility of NCBDDD, the Executive Committee has set a goal of reaching 500 members by the end of 2012. We are calling upon our current members to help us reach our target. As a reminder to you in your recruitment efforts, the Friends of NCBDDD offers multiple ways for members to engage with NCBDDD and various partners and there is no fee to join. To join the Friends of NCBDDD, please contact the Member Chair, Adriane Griffen (agriffen@aucd.org). Thank you for your support as we continue to grow the Friends of NCBDDD. As always, please contact me with any questions, concerns or ideas at rcarlin@aahd.us or call at (301) 545-6140 ext. 206. Please visit the Friends of NCBDDD website at www.friendsofncbddd.org for regular updates. NCBDDD recently hosted a Mother’s Day Facebook Chat on healthy pregnancies. Partnering with Healthy Mothers Healthy Babies and Heidi Murkoff of “What to Expect When You Are Expecting,” the chat focused on healthy pregnancies and was a huge success. Drs. Coleen Boyle and Cynthia Moore were joined by a host of subject matter experts and NCBDDD communication staff to answer dozens of questions, providing accurate information and great resources for families. Together, NCBDDD was able to continue promoting the work of the Center in a very personal way. NCBDDD is equally excited about hosting a Facebook Chat in honor of Father’s Day on June 12th at 3pm. The chat will focus on child development for ages 1-3 and will include information sharing from NCBDDD’s developmental milestone checklists and also positive parenting tips. In addition to working with external partners, NCBDDD will be inviting CDC’s National Center for Injury Prevention and Control (NCIPC) to contribute their content on preventing injuries during the toddler years. In conjunction with the Mother’s Day Chat, NCBDDD launched a beautiful and touching Flickr album which features photos and healthy pregnancy tips from 27 NCBDDD Moms. The album has been viewed over 1500 times and each day Dr. Boyle has been tweeting a different Mom’s tip and many have been re-tweeted by partners. Visit the Mother’s Day Flickr album here: http://www.flickr.com/photos/cdcsocialmedia/sets/72157629576624426/. Home Care of Children and Youth With Complex Health Care Needs and Technology Dependencies was published in the May issue of Pediatrics. Children and youth with complex medical issues, especially those with technology dependencies, experience frequent and often lengthy hospitalizations. Hospital discharges for these children can be a complicated process that requires a deliberate, multi-step approach. In addition to successful discharges to home, it is essential that pediatric providers develop and implement an interdisciplinary and coordinated plan of care that addresses the child’s ongoing health care needs. The goal is to ensure that each child remains healthy, thrives, and obtains optimal medical home and developmental supports that promote ongoing care at home and minimize recurrent hospitalizations. This clinical report presents an approach to discharging the child with complex medical needs with technology dependencies from hospital to home and then continually addressing the needs of the child and family in the home environment. All policy documents from the AAP Council on Children with Disabilities can be found at: http://www.medicalhomeinfo.org/about/cocwd/. American Society of Hematology (ASH), the world’s largest professional Society committed to the study and treatment of blood disorders, issued a report urging federal agencies to coordinate hematology research funding around seven specific high-need areas that would produce the greatest impact and translate into improvements in patient care in the United States. The newly released ASH Agenda for Hematology Research illustrates how several modern hematology research breakthroughs have resulted in significant improvements in care for patients with blood disorders and cancers, such as acute lymphoblastic leukemia, chronic myeloid leukemia, and multiple myeloma. Perhaps more importantly, the ASH Research Agenda demonstrates how hematology research has led to extraordinary gains in patient care across all of medicine, and emphasizes how support for biomedical and hematology research must be protected from budget cuts because such work provides an enormous return on investment. By identifying the most promising areas of research, ASH hopes to work with federal agencies and other stakeholders to prioritize and leverage limited resources with the goal of supporting research that will ultimately improve patient care. For more information on the ASH Research Agenda, and to download a free copy of the report or a two-page summary, visit: www.hematology.org/researchagenda. Parent Project Muscular Dystrophy (PPMD) convened a high-impact meeting with leaders of the Food & Drug Administration’s (FDA) drug review center to seek ways to accelerate the review process and to ensure the patient voice in key decisions. The meeting was called by PPMD and attended by Founding President/CEO Pat Furlong, PPMD board members, and parents of boys with Duchenne. High-level FDA leaders also participated, including the leader of the agency’s Center for Drug Evaluation and Research and the head of the Neurology Products Division. It led to a fruitful exchange and a path forward to a larger roundtable discussion that would focus on clinical trial design and the validation and acceptance of surrogate endpoints. National Forum on Disability Issues – Save the Date! The National Forum on Disability Issues will be held at the Hyatt Regency in Columbus, OH on Friday, September 28, 2012. This will be a non-partisan forum where presidential contenders are scheduled to offer their visions of policy that affects people with disabilities. Invitees include President Barack Obama and presumptive Republican presidential nominee Mitt Romney. For more information please visit http://cdd.unm.edu/swconf/, email swdisabilityconference@salud.unm.edu, or call (505) 272-3261. The world’s top scientists and clinicians in the human genetics field will gather to present their latest research findings at the 62nd Annual Meeting of the American Society of Human Genetics (ASHG), on November 6-10, 2012, in San Francisco, CA. ASHG is the primary professional membership organization for human genetics specialists worldwide, representing nearly 8,000 researchers, academicians, clinicians, genetic counselors, nurses, and others with a special interest in this area. ASHG’s Annual Meeting continues to be the largest human genetics meeting in the world, attracting more than 7,000 scientific participants each year. The ASHG 2012 Meeting will provide attendees with the latest information about cutting-edge developments in human genetics and genomics research. In addition, nearly 250 U.S. and international exhibitors will offer an unprecedented opportunity to view the latest advances in genetics-related technology, products, and services. Topics to be addressed in the ASHG 2012 scientific program include: gene discovery in human genetics; medical genetics and translation to/applications in clinical care; advances in non-invasive prenatal diagnosis; progress in gene therapy; personalized medicine; cancer genetics; new insights from next generation sequencing; implications of population genetic studies; modeling in statistical genetics; ethical, legal and social implications of genomics; and much more. Click here to learn more, register, or submit an abstract! The abstract submission deadline is June 4, 2012.